Under new artistic direction, the Toronto Festival of Clowns is back for its 11th year. Happening at Factory Theatre, the festival hosts a diverse cast of international and local clowning talent. Can you talk about the 2016 Toronto Festival of Clowns specifically, and also about the festival in general? 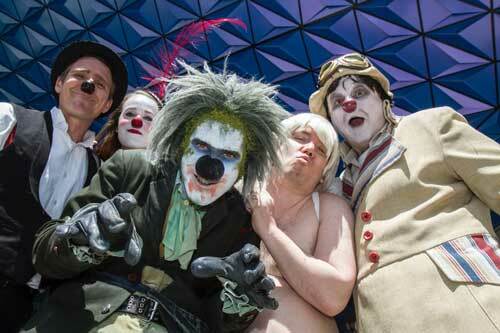 We want to bring the best of clowning to Toronto. Our city is home to an awesome and diverse clown community and for the past ten years we’ve been able to bring that community together, showcasing the best from here and abroad. The big change this year is moving to three artistic directors. There are so many different types of clown that this only makes sense: Jeff Kearns has a circus background; Allan Turner is a red-nosed cabaret star; and I’m more of a traditional theatre guy. Working together we’ve created an incredibly diverse festival of new and established work making a weekend of can’t-miss comedy. You have what sounds like a hilariously interesting lineup. Can you get into specifics about any performances that are either generating a lot of buzz, are especially unique, or that you’re looking forward to in particular? Canadian Comedy Award Winner Ken Hall is part of our Double Bill. He’s a local favourite and he keeps getting TV bookings for good reason: he’s hilarious. You might want to avoid having a full bladder when watching him or risk peeing your pants. Paul Wildbaum is a master clown with a long career and we are very honoured to be able to showcase him in Monsieur Faux Pas’ Aha! The youth and energy of SNACK MUSIC is absolutely captivating and has earned five star reviews across the country. This show is jaw dropping and has a bit of everything; beat-boxing, physical theatre, found-object puppetry and musical improv’. How can you go wrong? We’ve even brought in a clown from Columbia: Catalina Del Castillo. She performs a solo piece, Ferocious, that explores violence against women and showcases clown’s ability to take on hard-hitting subjects with humanity and panache. It seems that many folks associate clowning with either red-noses, creepy nightmare clowns, or Ronald McDonald, rather than an art form unto itself. What is clowning, and can you break down some of the different styles audiences might see during the festival, especially some that may not be as well known to a mainstream audience? Clowning comes in all sorts of different shapes and sizes and may or may not have a red nose. The horror movie clown is so pervasive that one of our most popular clowns, Mullet, has turned it on its head. Not just a clown, but also a Zombie, he is the sweetest least creepy clown you have ever seen. Toronto has its own style of clowning called Pachinko which grew from a mix of native and western clowning. Michael Kennard of Mump and Smoot fame studied under Pachinko, and directed Sama Kutra, an examination of modern marriage. That’s an amazing lineage of clown royalty being filtered into the next generation of performers. Morrow and Jasp director Byron Laviolette also brings newcomers Bravo and Ink to our Triple Bill. Toronto’s Queen of Clowning Helen Donnelly has taken her Reverend Foo and is putting it on the Factory Mainstage for a full hour. You can’t talk about Clown in Canada without Cirque du Soleil. Courtenay Stevens has toured the world with Cirque du Soleil where he has mastered his technique. As for clowns that don’t use red-nose, Sacha Baron Cohen and Stephen Colbert are the go-to pop culture references but we have our own examples. In Love with Leila, a bearded drag queen interacts with audience and helps us understand a slice of Muslim culture, all while she keeps looking for love. Another example is my own Adult Baby Cupid, who’s hosting the Red Nose District. Who needs a nose when you’ve got a diaper and wings! Generally speaking, clowning is a surprisingly honest format. We respond immediately to our environment and we tell big truths that might go unheard if we weren’t wearing a clown persona. Anything you’d like to add about the festival, or about clowning in general? I would be remiss if I didn’t mention the Lunacy Cabaret. From September to May they give Toronto a monthly showcase where clowns and circus performers from all over can try new stuff. It’s become a second home to all sorts of performers. We always give them a special slot on the Saturday of the Festival in return. Anything can happen there and it almost always does!